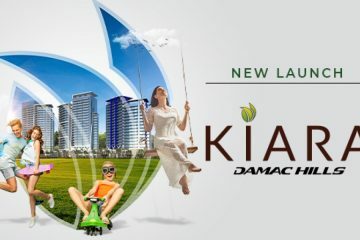 The Damac properties do not require to be introduced to any person living in the Middle East or Dubai. This Dubai and United Arab Emirates based company has created an altogether new standard definition since the time it has set foot into the real estate industry. It has undertaken great projects such as the AKOYA Oxygen, wherein the golf club of Dubai that is housed in the centre of AKOYA Oxygen has been designed by the very famous and probably the greatest player the history of the golf game has ever been a witness to i.e. TIGER WOODS. 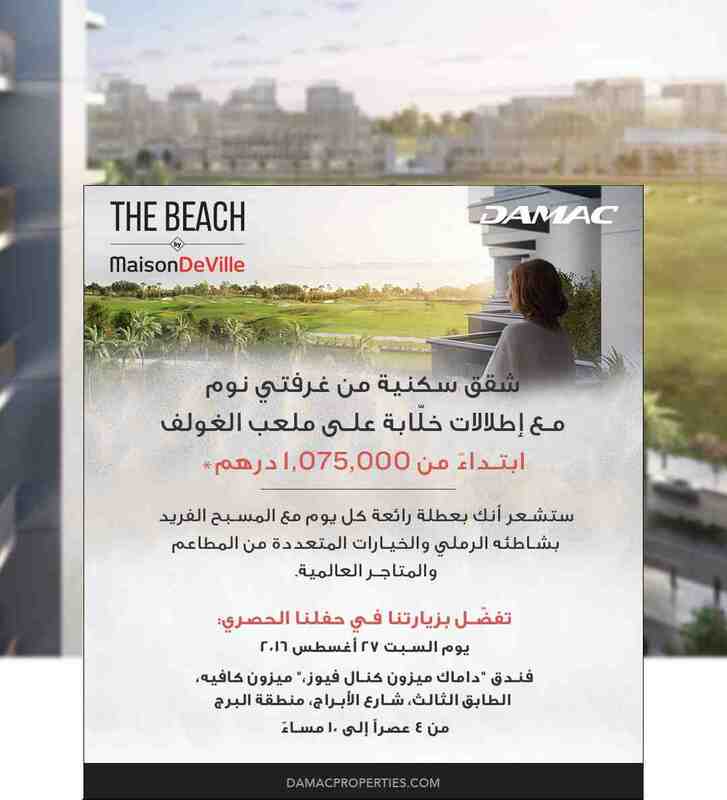 After quite a successful launch of the AKOYA Oxygen, the Damac properties plans to launch yet another of their projects located within the AKOYA Oxygen by the name THE BEACH. The beach is an exclusive property that houses two bedroom resort style residences that provide full range views of the golf club. Designed by Maison De Ville, the beach is an excellent option for those who wish to discover themselves and unwind into the peace and get a glimpse of a tension and work free life. With a total of nine towers, the beach offers a wide variety for you to choose from. You can own a residence or a hotel apartment, and in case you do not wish to own the entire place out of the total nine towers, there are also available luxurious suites and hotel rooms that let you stay and relax yourself and unleash your true capabilities. No matter whether you own an apartment or pay a short visit to the beach, you are granted an uninterrupted access to a plethora of world class facilities that are sure to set you into your best mood of fun and frolic. From the cleanest swimming pools with clear blue and refreshing to the lush green pastures, a whole array of fine dining options, shopping at great places and famous brands to pool side bars and a golf course, life at the beach offers you all. Apart from offering you with a luxurious life style, the beach can also be your wish fulfiller by being an investment. You can invest in the hotel towers and earn tremendously high rates of return. This can be accomplished by you providing forty percent share of the hotel room revenue and making the Dubai hospitality industry your investment return partner. The residences in the beach offer a multifunctional stress relieving environment to you. 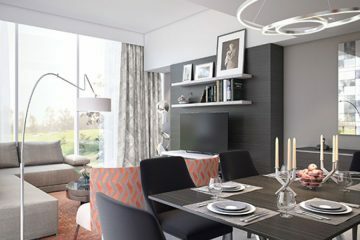 You can enjoy a wide range of leisure and relaxing options as well as have the liberty of enjoying various cuisines from different parts of the world in the fine dining restaurants that are just a few moments away from your ultrafine residence. Of all the facilities, the best one is the way of a care free and stress free life the residents of the beach and AKOYA Oxygen experience. The hotel apartments are a two in one combination pack for those having a taste for luxury services. At the hotel apartments of the beach, you can experience a whole new world of the luxury the hotel services have to offer you with. While indulging into a pool of luxury, you can also have for yourself the best in class luxury services. The hotel apartments offer you the comfort zone of a home and also the relaxation with the excellent services of the brand. The busy nature, hustle and bustle of city life often leads us far away from ourselves and the one thing that gets heavily disturbed is the balance of our life. So the beach has been set up keeping in mind some very captivating ideas of maintaining a balance between personal and professional life that you are bound to take advantage of. For those who purchase a hotel apartment in the beach, a rental pool facility is also available. This pool is looked after and managed exclusively by the hospitality division of the DAMAC hotels and resorts. This means that even in case you are far off from your home and not staying in it, you can still earn a handsome amount of rental income. The DAMAC team has people with a great amount of experience in the luxury segment and has gained expertise for marketing properties. This is best suited as it is a direct relation that helps maximize your revenue while also keeping an eye on your hotel apartment. Apart from the income generation benefit, the other benefit regarding the renting is that your asset is being maintained as well as promoted while also being ready for you to use at any point of time. The residential towers with all their facilities of temperature controlled swimming pools, fully fitted kitchens, huge and elegant lobbies, twenty four hour concierge and ample of parking space pose no difficulties what so ever to the inmates. Among the first green and eco-friendly communities that offer residences as well as hotels in Dubai, the AKOYA Oxygen offers the residents of Dubai green and environment caring houses that are nestled directly in the lap of nature and are attached to the goodness of the earth. The greenery and the cascading waters of this place are definite to leave you springing to your feet with joy and awe. This is a development that is in close reach of the city but yet miles away from it and the chaos of the city. This is a one of its kind community that inspires a method of living where in all you look for and need is located close to your home. The AKOYA Oxygen also plays a proud host to the first rain forest of Dubai and a world golf club along with a hydro phonic café. The development portfolio of the DAMAC group has over 44000 units that are at different planning stages and 16000 fully completed units. At this rate, the DAMAC Group is soon to be a name synonymous to luxury and quality. The Beach by Maison DeVille at AKOYA OXYGEN”. Starting Price for a Residential 2BR unit (Full Golf View) from AED 1,075,000/- only. 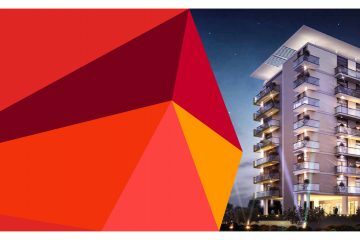 Token Deposit for Individual unit booking Minimum AED 20,000/- token shall apply for any individual unit. – Unit CANNOT be booked if the client have not paid deposit on any existing unit i.e “Pending DP” & “Pending Docs”. – Reject & Rebooking of the units under this promotion is strictly not allowed; any deal found shall be rejected instantly. – Any Client with rejected unit(s) booked in 2016 cannot buy unless full DP is Paid on new unit. 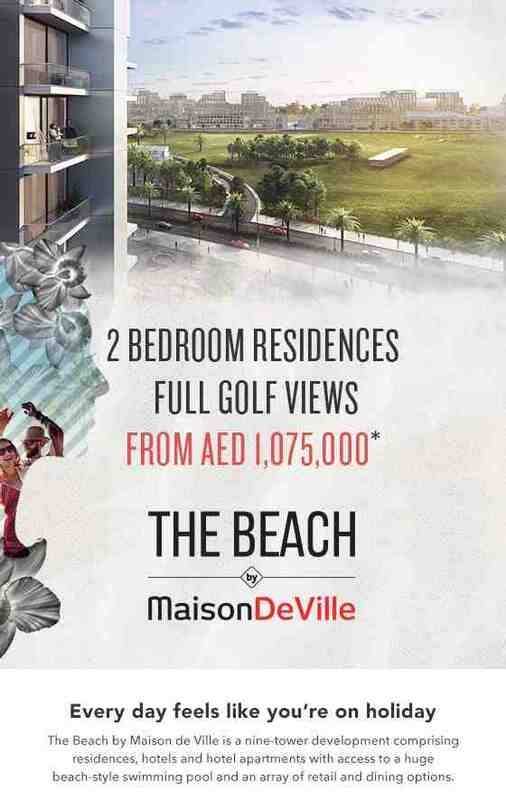 Two bedroom apartments at The Beach by Maison DeVille at Akoya Oxygen starting from AED1,075,000.